From NYT bestselling author Brent Weeks comes the first novel in his breakout fantasy trilogy in which a young boy trains under the city's most legendary and feared assassin, Durzo Blint. For Durzo Blint, assassination is an art--and he is the city's most accomplished artist. For Azoth, survival is precarious. Something you never take for granted. As a guild rat, he's grown up in the slums, and learned to judge people quickly--and to take risks. Risks like apprenticing himself to Durzo Blint. But to be accepted, Azoth must turn his back on his old life and embrace a new identity and name. As Kylar Stern, he must learn to navigate the assassins' world of dangerous politics and strange magics--and cultivate a flair for death. Devour this blockbuster tale of assassination and magic by Brent Weeks, which has delighted readers all over the world--with over one million copies in print! Brent Weeks was born and raised in Montana. He wrote on bar napkins and lesson plans before landing his dream job years and thousands of pages later. Brent lives in Oregon with his wife, Kristi, and their daughters. 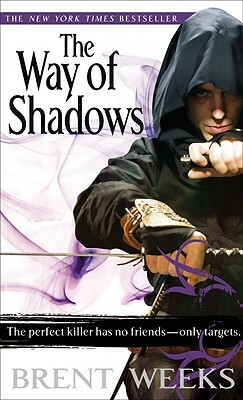 Find out more about the author at www.brentweeks.com or on twitter @brentweeks.